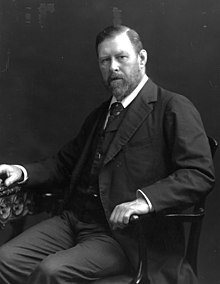 Abraham Stoker (8 November 1847 – 20 April 1912) was an Irish novelist and short story writer who wrote under the name Bram Stoker, most famous as the writer of the influential horror novel Dracula. Do not grieve for her! Who knows, but she may have found the joy she sought? Love and patience are all that make for happiness in this world; or in the world of the past or of the future; of the living or the dead. She dreamed her dream; and that is all that any of us can ask. It is a strange world, a sad world, a world full of miseries, and woes, and troubles. And yet when King Laugh come, he make them all dance to the tune he play. Do you not think that there are things which you cannot understand, and yet which are, that some people see things that others cannot? But there are things old and new which must not be contemplated by men's eyes, because they know, or think they know, some things which other men have told them. You shall be sorry yet, each one of you! You think you have left me without a place to rest, but I have more. My revenge is just begun! I spread it over centuries, and time is on my side. Seven years ago we all went through the flames. And the happiness of some of us since then is, we think, well worth the pain we endured. I heard a heavy step approaching behind the great door, and saw through the chinks the gleam of a coming light. Then there was the sound of rattling chains and the clanking of massive bolts drawn back. A key was turned with the loud grating noise of long disuse, and the great door swung back. "Welcome to my house! Enter freely and of your own free will!" I am Dracula, and I bid you welcome, Mr. Harker, to my house. Come in, the night air is chill, and you must need to eat and rest. Dracula referring to the howling of the wolves to Jonathan Harker. I have always thought that a wild animal never looks so well as when some obstacle of pronounced durability is between us. A personal experience has intensified rather than diminished that idea. You think to baffle me, you with your pale faces all in a row, like sheep in a butcher's. You shall be sorry yet, each one of you! You think you have left me without a place to rest, but I have more. My revenge is just begun! I spread it over centuries, and time is on my side. Your girls that you all love are mine already. And through them you and others shall yet be mine, my creatures, to do my bidding and to be my jackals when I want to feed. Bah! The sun was almost down on the mountain tops, and the shadows of the whole group fell upon the snow. I saw the Count lying within the box upon the earth, some of which the rude falling from the cart had scattered over him. He was deathly pale, just like a waxen image, and the red eyes glared with the horrible vindictive look which I knew so well. As I looked, the eyes saw the sinking sun, and the look of hate in them turned to triumph. But, on the instant, came the sweep and flash of Jonathan's great knife. I shrieked as I saw it shear through the throat. Whilst at the same moment Mr. Morris's bowie knife plunged into the heart. It was like a miracle, but before our very eyes, and almost in the drawing of a breath, the whole body crumbled into dust and passed from our sight. I shall be glad as long as I live that even in that moment of final dissolution, there was in the face a look of peace, such as I never could have imagined might have rested there. The fame of an actor is won in minutes and seconds, not in years. The man riveted my attention. He was dark, and forceful, and masterful, and ruthless. I have never seen so iron a countenance. Logically speaking, even the life of an actor has no preface. He begins, and that is all. And such beginning is usually obscure; but faintly remembered at the best. Art is a completion; not merely a history of endeavour. It is only when completeness has been obtained that the beginnings of endeavour gain importance, and that the steps by which it has been won assume any shape of permanent interest. After all, the struggle for supremacy is so universal that the matters of hope and difficulty of one person are hardly of general interest. When the individual has won out from the huddle of strife, the means and steps of his succeeding become of interest, either historically or in the educational aspect — but not before. From every life there may be a lesson to some one; but in the teeming millions of humanity such lessons can but seldom have any general or exhaustive force. The mere din of strife is too incessant for any individual sound to carry far. Fame, who rides in higher atmosphere, can alone make her purpose heard. Well did the framers of picturesque idea understand their work when in her hand they put a symbolic trumpet. The fame of an actor is won in minutes and seconds, not in years. The latter are only helpful in the recurrence of opportunities; in the possibilities of repetition. It is not feasible, therefore, adequately to record the progress of his work. Indeed that work in its perfection cannot be recorded; words are, and can be, but faint suggestions of awakened emotion. The student of history can, after all, but accept in matters evanescent the judgment of contemporary experience. Of such, the weight of evidence can at best incline in one direction; and that tendency is not susceptible of further proof. So much, then, for the work of art that is not plastic and permanent. There remains therefore but the artist. Of him the other arts can make record in so far as external appearance goes. Nay, more, the genius of sculptor or painter can suggest — with an understanding as subtle as that of the sun-rays which on sensitive media can depict what cannot be seen by the eye — the existence of these inner forces and qualities whence accomplished works of any kind proceed. It is to such art that we look for the teaching of our eyes. Modern science can record something of the actualities of voice and tone. Writers of force and skill and judgment can convey abstract ideas of controlling forces and purposes; of thwarting passions; of embarrassing weaknesses; of all the bundle of inconsistencies which make up an item of concrete humanity. From all these may be derived some consistent idea of individuality. This individuality is at once the ideal and the objective of portraiture. "Why," he said, " I thought I introduced you!" "Tell me, why do you want to know?" "Because," I answered, "I never saw any one like him. He is steel! He would go through you like a sword!" "You are right!" he said. "But I thought you knew him. That is Burton — Captain Burton who went to Mecca! My first impression of the man as of steel was consolidated and enhanced. He told us, amongst other things, of the work he had in hand. Three great books were partially done. The translation of the Arabian Nights, the metrical translation of Camoëns, and the Book of the Sword. These were all works of vast magnitude and requiring endless research. But he lived to complete them all. Burton had a most vivid way of putting things — especially of the East. He had both a fine imaginative power and a memory richly stored not only from study but from personal experience. As he talked, fancy seemed to run riot in its alluring power; and the whole world of thought seemed to flame with gorgeous colour. Burton knew the East. Its brilliant dawns and sunsets; its rich tropic vegetation, and its arid fiery deserts; its cool, dark mosques and temples; its crowded bazaars; its narrow streets; its windows guarded for out-looking and from in-looking eyes; the pride and swagger of its passionate men, and the mysteries of its veiled women; its romances; its beauty; its horrors. Go home, Johann — Walpurgis nacht doesn't concern Englishmen. Be careful of my guest — his safety is most precious to me. Should aught happen to him, or if he be missed, spare nothing to find him and ensure his safety. He is English and therefore adventurous. There are often dangers from snow and wolves and night. Lose not a moment if you suspect harm to him. I answer your zeal with my fortune. Telegram to Bistritz from Count Dracula.